The script generates the links that are perfectly indexed by Google robots. Every picture, Tag, browsing phrase, album etc. have a separate subpage with a link that is friendly for robots. It helps to quickly index the entire website. Every subpage has a permanent base for meta tag parameter: title, keywords and description, which is set in the admin panel. What is more, matching phrases are added to every subpage, e.g. picture, album etc. Meta tag parameters have different language versions. Therefore, if you set different language than English as a default language, the entire site will be translated, including meta tags. In order to help the Google robot to index the entire site, the script automatically generates the sitemap files. Google introduced a limit for the size of sitemap file, which is 50 000 URLs or 10 MB. 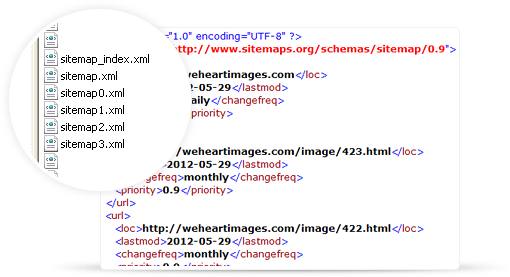 This is why the script automatically creates sitemap_index.xml file where references to the generated sitemap.xml files are kept. (each having 20 000 URLs). This is a perfect solutions for quickly-developing services. 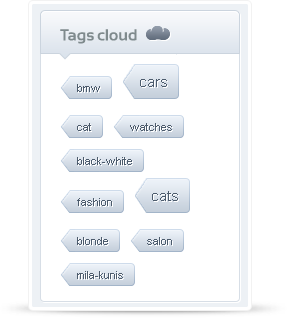 A tags cloud is displayed on every subpage. 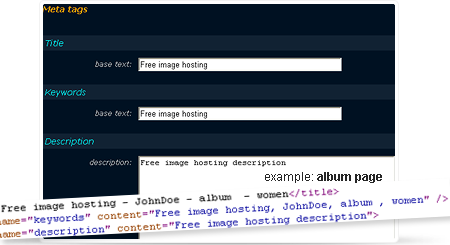 Moreover, every tag has a separate subpage with a list of images that it represents. This helps to build a website with a great number of subpages, which is important in SEO. On the main page and in many subpages there is a box with recently entered search phrases. In order not to direct the user and Google robot to empty pages, only the phrases with results are displayed. Such mechanism helps the Google robot to index more subpages.